Last Sunday night, as my weekly menu plan started to take shape, an autumnal influence became obvious. Cabbage, apples, leeks and carrots all had a featured spot over the week. And why not? This produce is beckoning from the market stalls: firm, vibrant and, best of all, a bargain. It deserves to be snapped up and served for dinner. 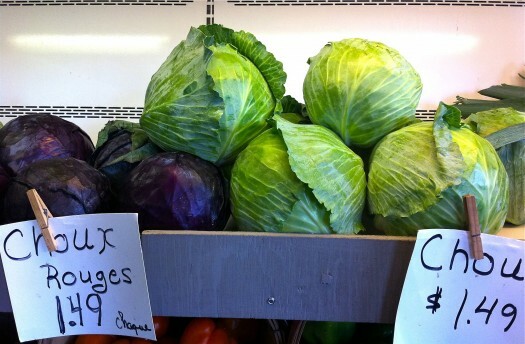 Cabbage just might be the best bargain out there. At this time of the year the heads are tight, bright green and so crisp, they practically snap in two at the nudge of a knife. Green, red and savoy cabbage are all competing for attention, but I’ve been buying the green for its versatility. Today, I’d like to offer you 4 easy ways to prepare this leafy fall vegetable. Note: In general, fresh cabbage heads can be stored in a refrigerator crisper for up to two weeks. Once it is quartered, wrap each wedge tightly with plastic wrap and use within 2-3 days. When chopped cabbage is cooked with a small amount of liquid -either stock, vinegar, alcohol or water- and covered with a lid, this is called braising. The results are tender and flavorful and the cabbage needs only a pat of butter before serving. Red cabbage is most frequently prepared this way, braised with flavorings such as beer, port, or apple cider, but green cabbage is equally delicious. Molly of Orangette professes her love of a slow-braised Green Cabbage with Onions, Carrots, and a Poached Egg and I am inclined to agree – it looks scrumptious. If you enjoy cooked cabbage with a bit more texture, as I do, then a quick saute does the trick. Melted butter in a skillet, a mound of thinly sliced cabbage and 5-7 minutes of cooking time is all you need to enjoy your sauteed cabbage. 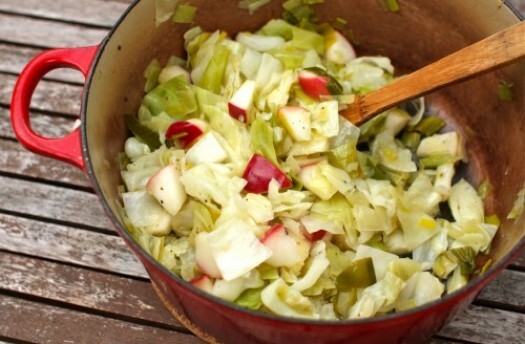 My recipe below elaborates slightly on the sauteed method, with leeks and apples joining the cabbage for a quick cook. It makes for a hearty side dish that highlights the season’s best ingredients. Crunchy coleslaw is a favorite salad of ours and we make it regularly over the winter months when we’re craving something green and fresh. 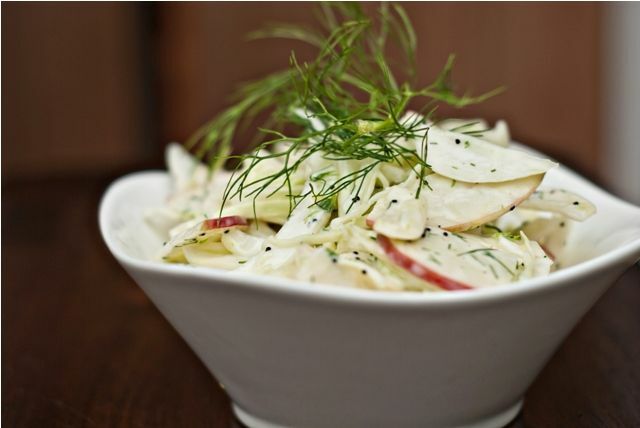 Often our slaws are as simple as chopped cabbage and grated carrot with a light sour cream and lemon dressing, but Elizabeth of Guilty Kitchen suggests an Apple and Fennel Slaw that has me thinking I need to expand my repertoire soon. She also pairs creamy coleslaw and pulled pork together in a wrap for a scrumptious fall dinner. Yes, I’m thinking the humble slaw is getting its makeover by Elizabeth. We’ve talked about lacto-fermentation before and Cordito, or fermented sauerkraut, is a great way to preserve cabbage. It’s also extremely nutritious and very beneficial for the digestive system. Traditional sauerkraut is also fairly simple to make, just be willing to wait nearly a week for the natural fermentation to happen. This recipe comes together quickly and in one big pot for easy clean-up. 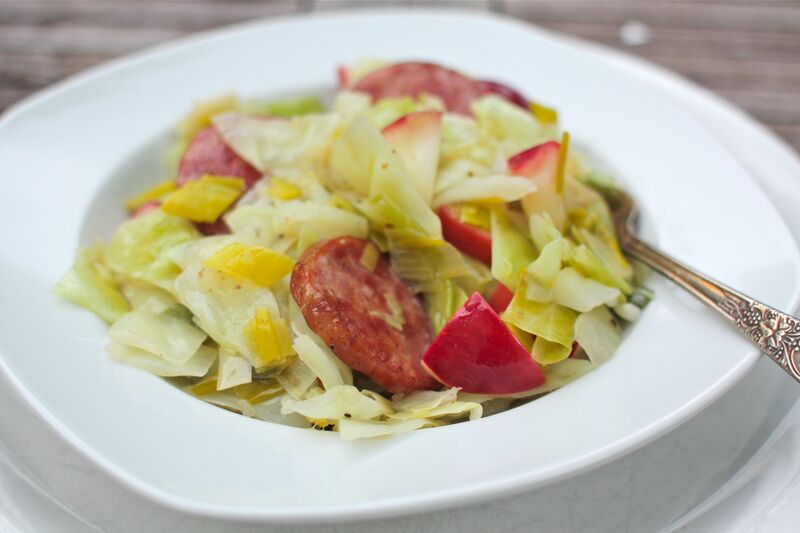 We like to pair our rustic cabbage saute with grilled bison sausages or slices of traditional Kielbasa, as pictured above. Add leeks to melted butter and saute for two minutes. Add the cabbage all at once and immediately stir thoroughly to coat the cabbage with butter. Season with salt and pepper. Add the apple to the cabbage as well as the apple cider vinegar. Saute on medium heat for another three minutes, stirring often. Taste for seasoning and adjust if necessary. Serve hot. Chardonnay vinegar can be substituted for apple cider vinegar and the whole dish would be lovely with a sprinkling of caraway seeds sauteed in the mix. White Beans and Cabbage :: Steamy Kitchen. It’s the cover recipe for Heidi Swanson’s fantastic cookbook, Super, Natural Everyday. Comfort food at its finest. Cabbage Apple Casserole :: Serious Eats. Obviously, I’m a fan of pairing apples and cabbage. Add bacon and I’m perfectly happy! PS. This would make an ideal rustic side dish to a baked ham Sunday dinner. Simple Summer Slaw :: Stetted. Megan spikes her coleslaw with a dash of curry and suggests using the salad as a topping for fish tacos. You don’t have to tell me twice. Reuben-Inspired Panini with Corned Beef & Roasted Cabbage :: Katie Goodman for Craft. These sandwiches have gotten into my head and I’m not going to rest until I’ve made a stack! How do you enjoy green cabbage? I still struggle eating it cooked after the crimes my mother committed to cabbage when I was growing up. I’ll have to give it a second chance and try your recipe! I actually love cabbage! But, I tend to make it one of two ways, either in a traditional boiled dinner, or as a spicy coleslaw. But this recipe looks amazing, and I am definitely going to try it! I love cabbage. Every which way. I am going to put this recipe on my meal plan. With kielbasa and apples, it looks wonderful! I’ve pretty much only ever eat cabbage as coleslaw, sauerkraut, or with corn beef and at Easter. I think I need to work on expanding my cabbage eating! I love Kalyn’s Roasted Cabbage with Lemon as a side dish. I made roasted cabbage with my Honey Marmalade Mustard Glazed Corned Beef last year instead of boiling it. Best thing ever! Thanks for some more ideas for using cabbage. I definitely don’t use it very often. Great links! Now I’m getting hungry. Absolutely trying this recipe! We love bigos, one of the recipes retained from our Polish side. Sauerkraut and cabbage married kielbasa and prunes. Yum! We have a cabbage slaw about 3-4 days a week. I use thinly sliced cabbage, apple, onion and dried cranberries and toss with a dressing of mayo, apple cider vinegar, salt, a little sugar and lots of freshly ground black pepper. Sometimes I also add kohlrabi. I slice half a head of cabbage at a time and keep it in a covered Pyrex baking dish in the fridge. I also make the dressing in advance. Then all I need to do is toss. I do not like my slaw to soften too much; I prefer the crunch. You just reminded me that my dad’s favorite dish is cabbage rolls. I need to learn how to make them and surprise him when they visit next month! I think I need that recipe, missy! Confession… I have a slight obsession with cabbage lately!! Its just SO yummy! SO thank you for posting this, I will be trying your recipe soon! I love cabbage, but I rarely cook with it. I’m adding it to my grocery list for the week. Thanks! I LOVE cabbage! Thank you for the great recipe & resources. Cabbage is one of those vegetables that I don’t tend to cook, I usually use it in slaws so I’m excited to try braising and sauteing it. We eat a lot of cabbage and potatoes, two very good deals. I always have a head in the fridge because it’s so versatile – raw, cooked, on it’s own, in other dishes. Love it. We love cabbage and noodles! Just saute cabbage with bacon, toss in cooked linguine noodles, top with feta and lots of fresh ground black pepper. Inexpensive, fast but not very pretty on the plate. Oh well, you can’t win them all. My DH cooks diced bacon then puts the shredded cabbage in, sauteing it for a few minutes then ads V8 juice. It’s okay, but my favorite way is just lightly steamed in the microwave. Then just a little salt, pepper, and butter. I’ll have to try adding a little vinegar or lemon juice when I cook it, that sounds interesting like it would add a little flavor without being over powering. My wife and I both enjoy Sauteed Cabbage over broad egg noodles. Growing up it was called fried cabbage and noodles. Makes a great side dish anytime. Everyone at my house loves cabbage. We eat it as rolls, soup (though not the icky diet kind), sauerkraut, stir fried with onions, kimchi, etc. Krautburgers are my favorite when served with spicy mustard. We have recently started eating less meat so I have been fixing more veggie based dishes. I made a casserole of cabbage, yellow squash and cauliflower. I precooked all of it and them threw it together along with a cheese sauce and baked it. Was very yummy! I am going to have to try your recipe! I have my own, slightly different version. No precise measurements, of course. Cut it all up and throw it in a large pot with some canola oil to prevent burning. Cover and stir often. Cook however long you feel necessary. We usually serve ours with some ketchup. YUM! Even better the next day, too! amazing what one can do with Cabbage.. and it’s very healthy. My favorite is to sautee it with onions and some cayenne pepper, or to have it in a salad with some apple vinegar sauce.